A BOLD AMBITION SIX YEARS of battling Lyme disease that included trending 24 WBM october 2017 being bedridden for two years ignited a fire within Sara Westermark’s creative spirit that is just getting started. “It’s like playing,” she says. 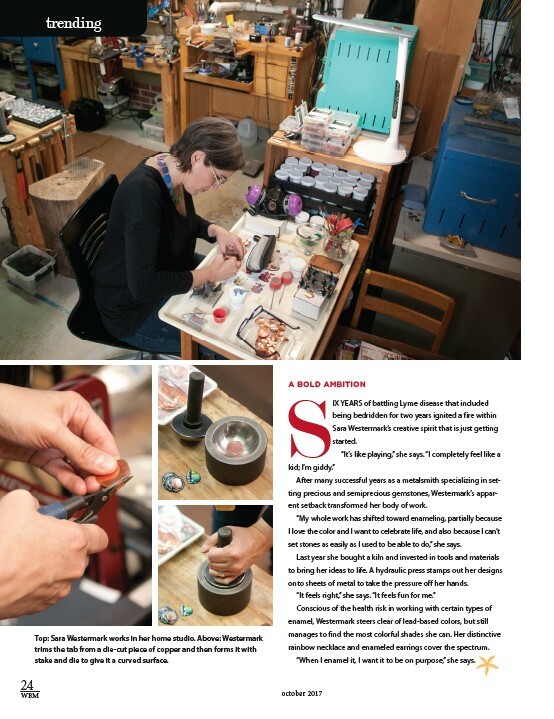 “I completely feel like a kid; I’m giddy.” After many successful years as a metalsmith specializing in set-ting precious and semiprecious gemstones, Westermark’s appar-ent setback transformed her body of work. “My whole work has shifted toward enameling, partially because I love the color and I want to celebrate life, and also because I can’t set stones as easily as I used to be able to do,” she says. Last year she bought a kiln and invested in tools and materials to bring her ideas to life. A hydraulic press stamps out her designs onto sheets of metal to take the pressure off her hands. “It feels right,” she says. “It feels fun for me.” Conscious of the health risk in working with certain types of enamel, Westermark steers clear of lead-based colors, but still manages to find the most colorful shades she can. Her distinctive rainbow necklace and enameled earrings cover the spectrum. “When I enamel it, I want it to be on purpose,” she says. Top: Sara Westermark works in her home studio. Above: Westermark trims the tab from a die-cut piece of copper and then forms it with stake and die to give it a curved surface.